Tom Yum Fried Rice recipe combines the hot and sour flavors of popular Tom Yum Soup with the speed and ease of stir-fried rice for a spicy, satisfying one-dish meal. If you are a fan of tom yum soup, you will love this fried rice. The fresh galangal and kaffir lime leaves really give it an authentic flavor. But if you can’t find them, you can omit them and just use lemongrass instead. In a mortar and pestle or blender, pound or grind the lemongrass, galangal, kaffir lime leaves, and chiles together to form a coarse paste. Transfer the paste to a small bowl, and stir in the fish sauce, soy sauce, chili paste, and lime juice. Set aside. In a wok or large skillet over medium heat, heat the oil. Add the scallion whites, mushrooms, and shrimp, and stir-fry for 1 minute. Add the rice and sauce mixture, and stir just until all the ingredients are coated evenly with sauce. Use a wooden spoon or spatula to break up any large clumps of rice. Add the tomato and scallion greens, and stir-fry for 1 minute more. Turn off the heat, add the cilantro, stir to distribute evenly, and serve immediately, with lime wedges for squeezing on top. In place of the shrimp, you can use 4 ounces of any boneless meat (for example, chicken or pork), cut against the grain into thin, bite-size pieces (about 1/4 inch by 2 to 3 inches). 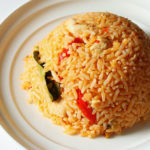 How did you like this Tom Yum Fried Rice recipe? Did you add anything to make it even more delicious? Please share with us in the comments. This Tom Yum fried rice recipe combines the hot and sour flavors of popular Tom Yum soup for a spicy, satisfying one-dish meal. 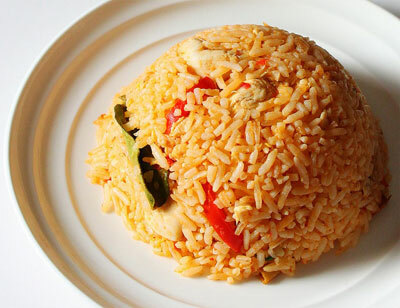 If you are a fan of Tom Yum soup, you will love this fried rice. Didn’t change a thing to this recipe and it has become a standard go-to dinner for my family. Absolutely love it!